traphic signs: remember that time we had a blog?! remember that time we had a blog?! well so it seems that kelley and I have fallen off the boat a bit. I'm not sure really why, perhaps the uninspired bad news in the world that is surrounding us right now. Anyway, to kick it back off I will show you a slide from a presentation I have been working on for a sales meeting. 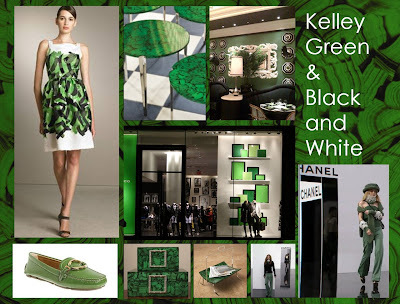 We are about to hit it big with Kelley Green and black and white in all our showrooms starting in High Point, throughout the summer. I was even more excited that it seems we are ahead of the trend as Valentino and Chanel just came out with the same colors for Next spring!! From Top left: dress from Valentino, GV table, Scene from the Wynn Encore las Vegas, Store front of Club Monaco in NYC, Prada loafers, malachite boxes GV, magazine cradle GV, scenes from 2010 CHANEL fashion show.